THE GREAT GLOBAL WARMING LIE! 2. 98%…that’s right, 98%…of climate scientists, including climatologists and others, report that there is no global warming. 3. The UN scientists/Al Gore fanatics disregard, among many, many things, the global temperature changes for the last two hundred years. Information before 1920 is anecdotal but so massive that it is effectively scientific. Here are the temperature changes for the last over two hundred years with a projection to 2050. The temperature values all the way on the left report the range of temperature change up and down (rise and dip). 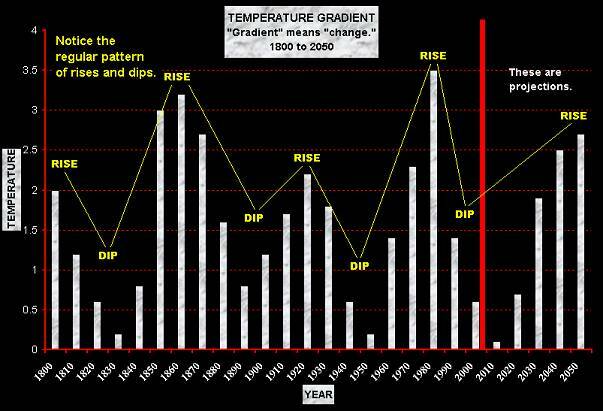 Notice how the temperature rises and dips over the 250-year period. We are at the cusp (a start of a direction change) of a warming period, WHICH WILL BE FOLLOWED BY A COOLING PERIOD. The following graphic may take a few seconds to load but it will be well worth the wait. a. Equivalent portions of Arctic water ARE FREEZING AT THE SAME TIME. Natural processes keep things in balance. 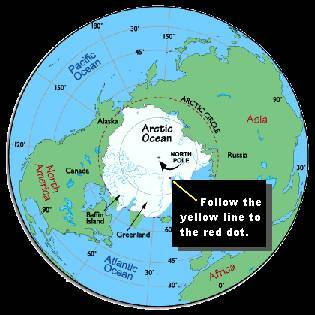 The net effect is that the polar ice cap is NOT melting. b. The portion of the Arctic affected is shown below. See the single red dot. Note that our red dot is ONE MILLION TIMES ACTUAL SIZE. If we had used an actual size red dot, you would not have been able to see it.